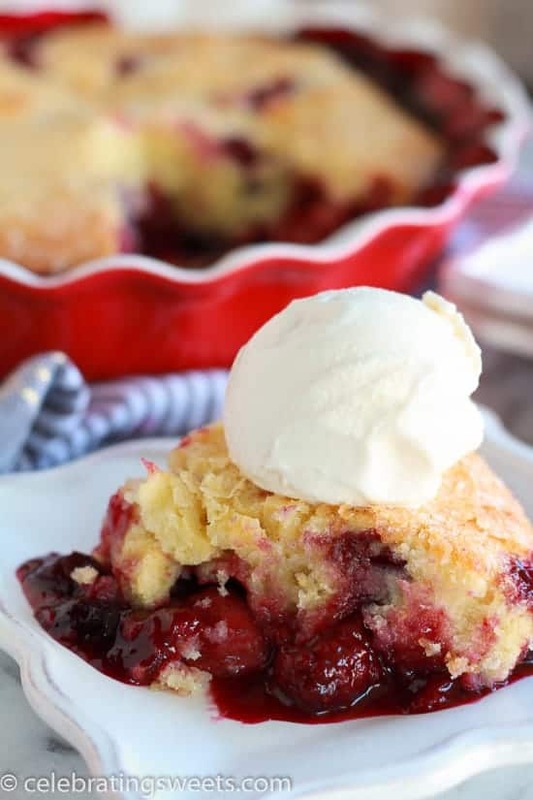 This Warm Berry Cake is a new family favorite. Frozen berries are topped with a rich vanilla cake and baked until bubbly, sweet, and juicy. An easy and delicious recipe that can be made year round. If you had to pick your favorite dessert, what would it be? For me, it would be some type of warm baked good topped with a scoop of ice cream. Think: warm brownie with ice cream, warm skillet cookie with ice cream, warm fruit crisp with ice cream. The warm and cold together gets me every time. And once the ice cream starts to get all melty … Ah! Love. 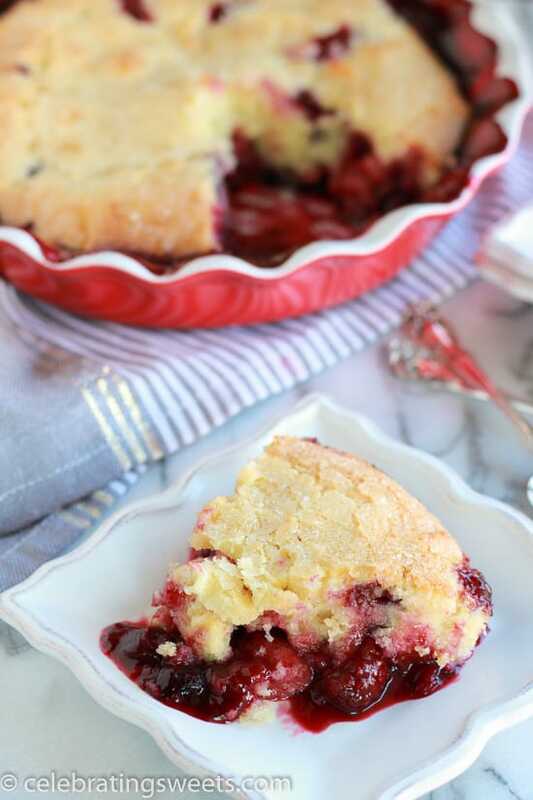 You won’t be surprised to hear that this Warm Berry Cake is one of my new favorites. 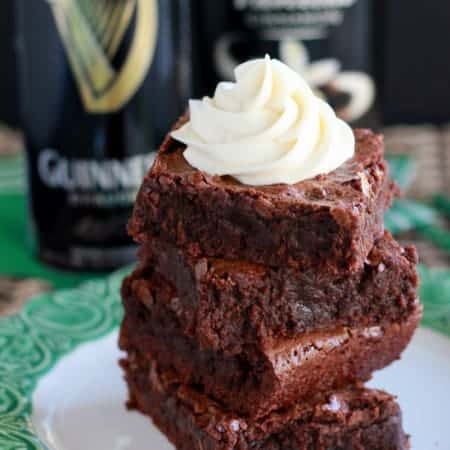 This recipe is unbelievably easy, and the end result is fabulous. 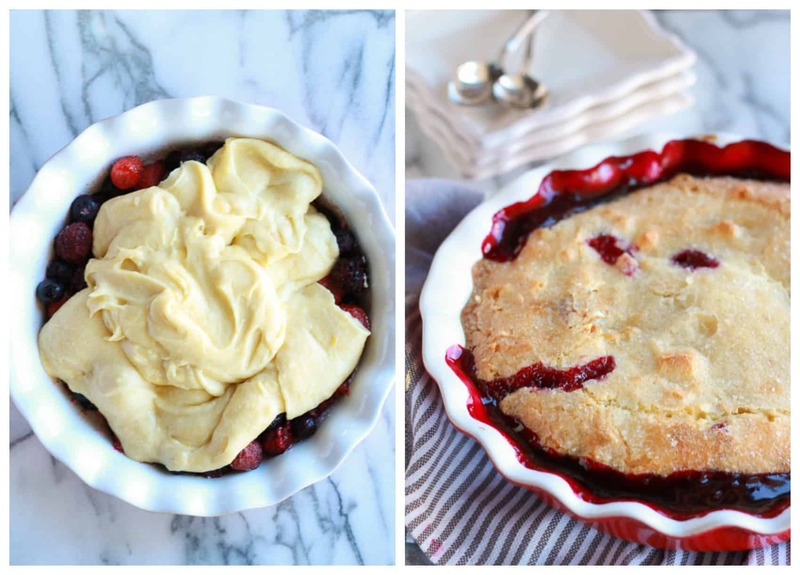 Frozen berries are mixed with sugar and cornstarch and placed in the bottom of a pie dish. A quick vanilla cake batter is made, then spread over the top of the berries. The cake batter gets a sprinkling of coarse sugar (for crunch), and then the whole thing is baked. 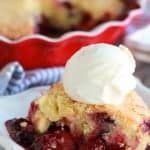 The berries get warm and juicy, and bubble up around the cake. The cake bakes up tender and moist, with a slightly crackly top, and a rich vanilla flavor. This cake would be perfectly fine as is, but here’s where it gets amazing. Take a scoop of vanilla ice cream and place it on top of a slice of the fresh-from-the-oven cake. Cool creamy ice cream + warm juicy berries + tender vanilla cake = mind blown. Tell me you don’t want to dive right into this picture and start stuffing your face. If I haven’t sold you on this cake yet, I’ll leave you with one more thing. Since this recipe uses frozen berries, it can be made year round. Yes, any day of the year, friends! No need to wait for berries to show up in your local market. There’s no excuse not to get baking. Frozen berries topped with a rich vanilla cake and baked until bubbly, sweet, and juicy. An easy and delicious cake that is served warm with vanilla ice cream. Preheat oven to 325°F. Butter a 10-inch pie dish and set aside. In a medium bowl, combine frozen berries, 1/2 cup of granulated sugar and cornstarch. Once combined, pour mixture into the prepard pie dish. In a large bowl, with a hand mixer or stand mixer, beat eggs and 1 cup sugar on medium speed for one minute. Add butter, vanilla extract and yogurt, and beat to combine, scraping the sides of the bowl as necessary. Add the flour and salt and beat once again, until just incorporated. Pour the batter over the fruit, spreading into an even layer, covering the fruit completely. Sprinkle the coarse sugar over the top of the batter. Bake for 55-60 minutes, until the fruit is bubbling around the edges and a toothpick inserted into the center of the cake comes out clean. Cool slightly. Serve warm with vanilla ice cream. The juices from the berries came all the way up the sides of my pie dish, almost spilling over. You can place a large piece of foil, or a baking sheet, under the pie dish to catch any juices that might bubble over. 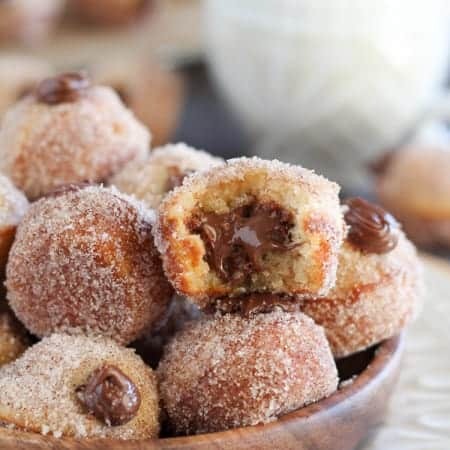 This is a delicious dessert! I was fortunate to be at your house one day when you made it and I loved the warm berries and cake topping! I would like to make this foe Easter! Looking at this is making my mouth water! Can can taste the sweet and tart berries. Yum! Hi! Found this on Pinterest and it looks amazing. My favorite dessert is also something warm with vanilla ice cream, like apple crisp! Pinning this and making it soon 🙂 Newest follower on Facebook and Pinterest. 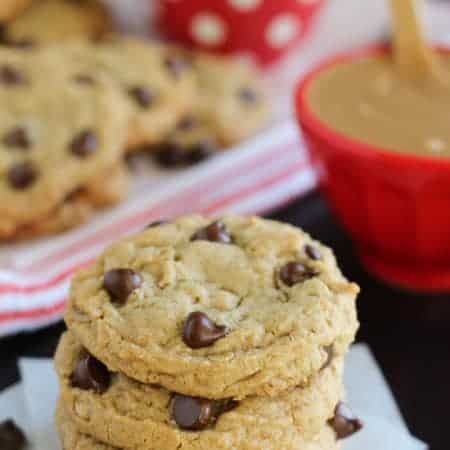 I made this recipe when your brother came to dinner and he loved it! He doesn’t like cakes or things with icing so this was a perfect dessert to serve. 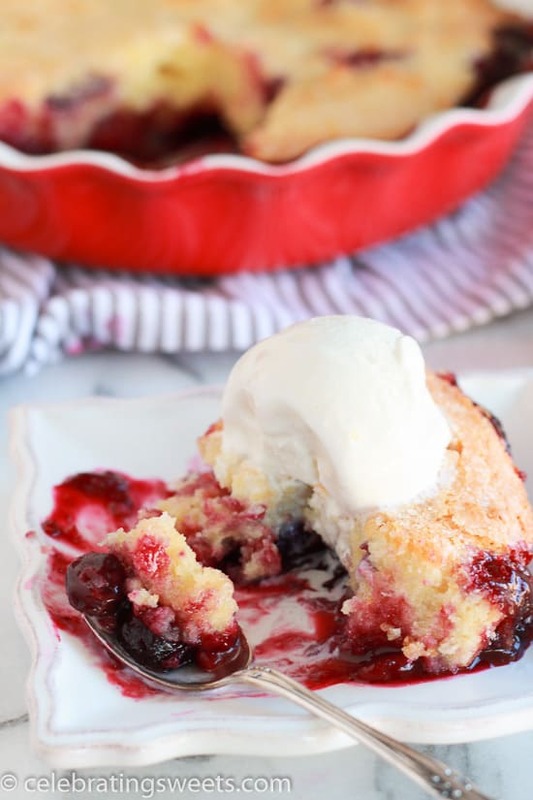 I think this recipe is a crowd pleaser and easy because you can use frozen berries. WIll an instant box cake mix work in this recipe? I’m not sure. If you try it, you definitely won’t need all of the batter. You’ll probably use about half of it, maybe a little more.